The check-in is mandatory by 7 pm (from April to September) by 6 pm (from October to March), in order to be able to better reach the Resort during daylight, due to its isolated position. and hosting art exhibitions. We recommend it to couples of all ages who want to live the nature, prefer the bio cuisine without giving up to the comfort and charm of an elegant country residence. Founded in 1637 by the Tomasi family, Palma Montechiaro, located a few miles from Agrigento, inspired Giuseppe Tomasi di Lampedusa in writing the famous novel "The Leopard". In its countryside stands the Mandranova Resort, surrounded by a beautiful garden with palm trees and African plants. On the hill, not far from the sea, there is the olive grove of the farm, which produces oil of very good quality. Its secluded location offers a truly spectacular view of the surrounding nature. Due to its position the check-in is mandatory by 7 pm (from April to September) by 6 pm (from October to March), in order to be able to better reach the Resort during daylight, due to its isolated position. The Hotel reserves the right to refuse arrivals outside the above mentioned times. Mandranova Resort is To the Airport Catania the distance is approx. 170 km and to the Airport Parlermo approx. 180 km. 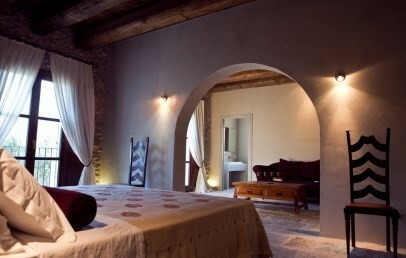 The typical Sicilian country house with its stables and its old stores, has now been transformed into an elegant residence that combines the traditional with the modern concept of hospitality. The rustic furniture live together with modern elements, creating a simple and friendly style setting, just a few steps from the sea of Sicily as well the infinity pool invites for a bath during the very hot moments (the pool is open from mid April to mid October). At Mandranova Resort, the rooms are divided into different environments. 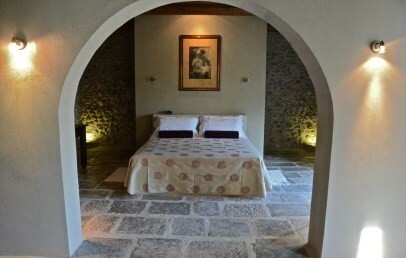 The Farmhouse (Il Casale), once composed of stables and warehouses, has six double rooms and three suites, featuring original family furnishings transporting guests in an atmosphere typical of the Sicily of the past. Two rooms are on the first floor of the Casello, which originally housed a small railway station dating back to the early '900. 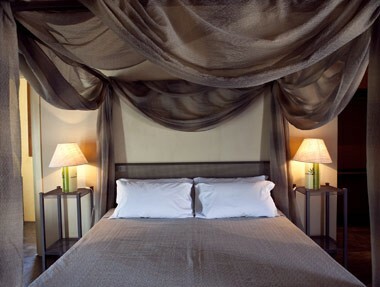 Spacious and bright, have a four poster bed and an independent air conditioning system. 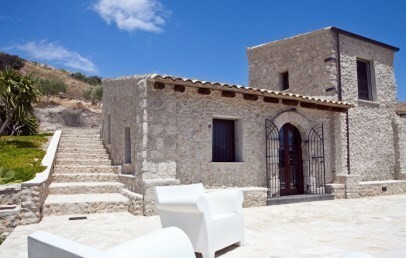 Villa Robazza, an old winery built of stone and plaster, houses on the ground floor two bedrooms, a living room, a small kitchen and a third bedroom in the turret, from where it is possible to enjoy a wonderful view of the sea. It has a privat pool and sun terrace. 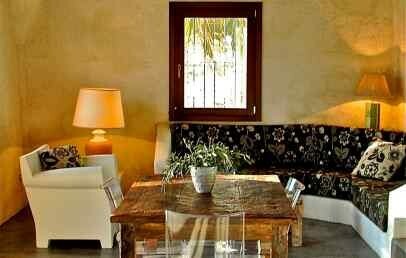 The Villa is also available in self-catering (on request), with the possibility of using the services of the hotel. The Restaurant of Mandranova Resort offers a traditional cuisine prepared with the products of the farm and of the territory; during the summer you can dine by candlelight in the garden in front of the restaurant. A wide selection of regional wines is available in the well-stocked cellar. The library, located in the Casale, is stocked with books in Italian and other language; during the winter months the crackling fire in the fireplace nicely accompanies the reading. In the summer, guests can find relaxing moments of peace in the tranquility of the beautiful pool. Mandranova Resort attaches great importance to promote the products of the farm, certain of their quality: Visits and tasting are held in the grounds of the Company as well as cooking classes; in September and October, visitors can personally participate to the olive-gathering and the production of the oil. 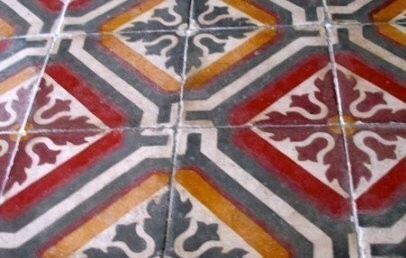 A welcoming double room located on the ground floor or the first floor. 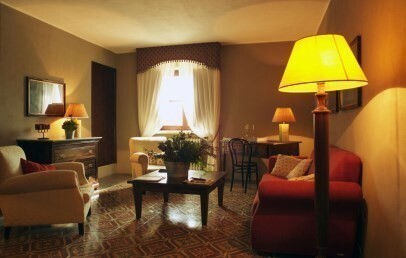 The Sicilian style, the original family furniture and various comforts make it nice and cozy. The bathroom has a shower and a hairdryer. 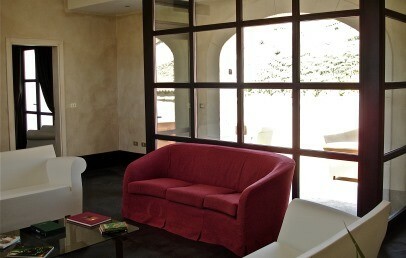 The standard rooms offer views of the garden or the olive grove. The check-in is mandatory by 7 pm (from April to September) by 6 pm (from October to March), in order to be able to better reach the Resort during daylight, due to its isolated position. The Hotel reserves the right to refuse arrivals outside the above mentioned times. Large Suite located on the first floor of the Resort. The double room cah host uwo additional beds on request. The bathroom has a shower and hairdryer. The suites overlook the garden. 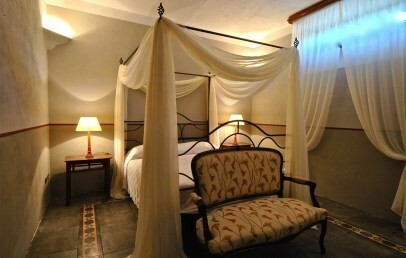 Large and elegant double room, it is possible on request add two additional beds. The bathroom provides shower and hairdryer. Some Superior rooms overlook the garden and have a common terrace shared with others rooms. A spacious Suite with a bedroom, a single room and a separate living room. 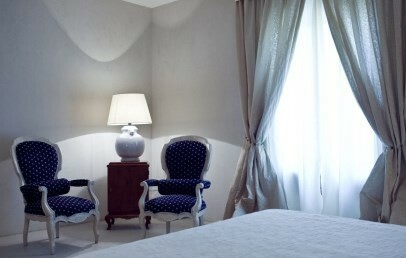 The Sicilian style and the family furniture give a luxurious atmosphere. The Master Suite has two bathroom with shower and hairdryer. 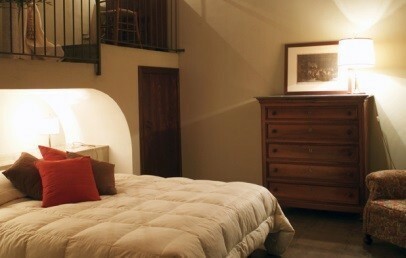 Master Suite have a garden and olive grove view. 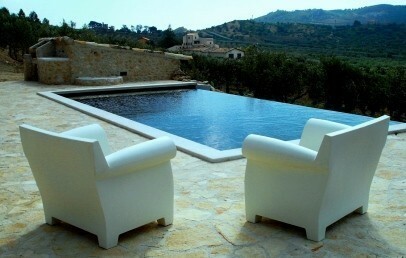 Villa Robazza is an independent villa surrounded by olive trees. 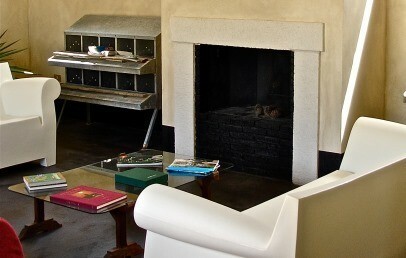 The distance to the main house of Mandranova is 300 m. Once an old winery, today a contemporary, comfortable place to stay. 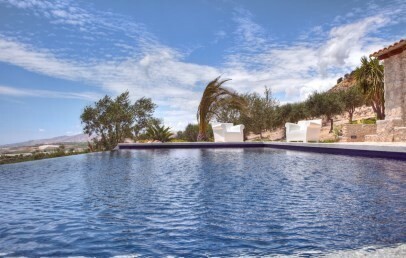 It offers a beautiful terrace with infinity-pool and magnificent panoramic view. The Villa has on the ground floor a living room, a small kitchen, two bedrooms with own bathroom and on the upper floor in the small tower a bedroom with two single beds.